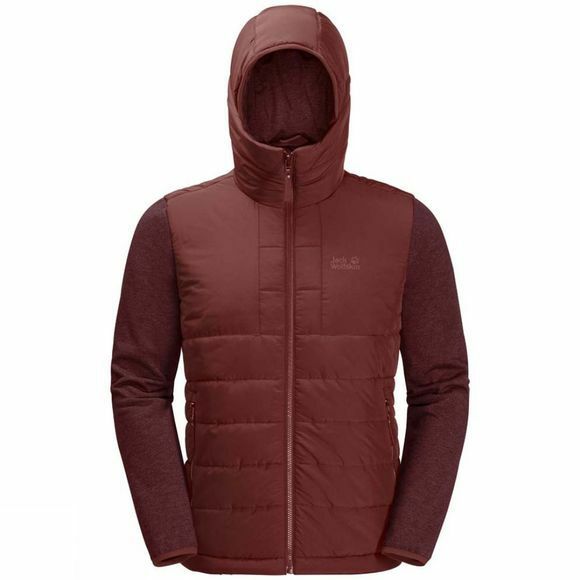 The Mens Skyguard Jacket from Jack Wolfskin has a clean, urban-Outdoor design, this piece will take you from city to summit In style. The torso of this Hybrid Jacket contaIns an extra thick Insulation material made of recycled synthetic fibres. This is contaIned within a Windproof Shell fabric, which boosts the Insulation performance significantly. The fabric on the sleeves of the Jacket is also Windproof and the High proportion of organic Cotton gives it a pleasant, natural feel. If you need a Jacket that provides full freedom of moveMent for your arms, the Skyguard is an excellent solution.